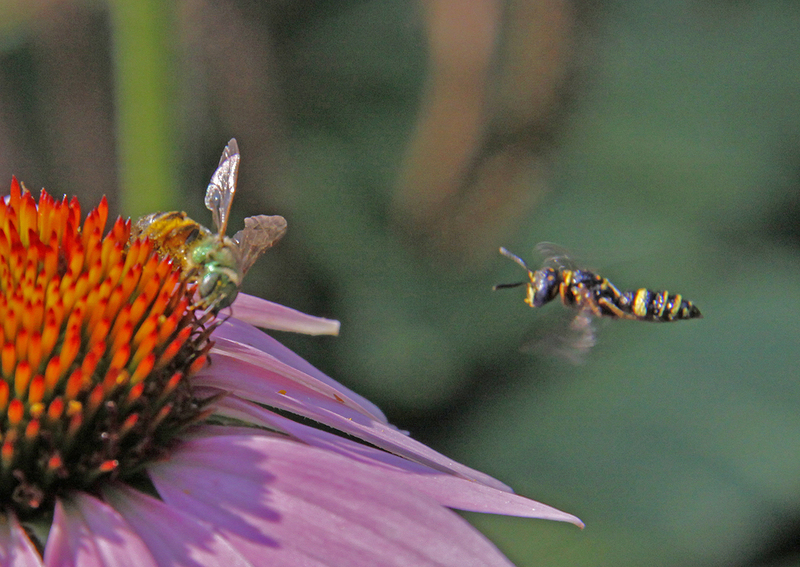 I was focusing on the Metallic Green Bee(Agapostemon) feeding on a purple cone flower when the small predatory wasp entered my camera's field of view. Since all my photography is hand-held, no tripod, I was able to ever so slightly adjust my camera position to include the wasp in the focal plane. I depressed the shutter button and got this image but before I could take a second shot, the wasp attacked the bee and both disappeared into the unknown. The Metallic Green Bee is a native solitary bee and they pollinate our flowering plants. I must admit I am a bit confused concerning the wasp. Is it a wasp or is it a wasp-mimicking Hoverfly. I tend to think it is a wasp because of the short-blunt antennae, the constriction of the thorax-abdomen junction and the point at the end of its abdomen. Without a hands on examination, I can't be certain.